And the Lord God formed man of the dust of the ground, and breathed into his nostrils the breath of life; and man became a living soul … And the Lord God said, It is not good that the man should be alone; I will make him an help meet for him. And they lived happily ever after … if only. Being in a marriage can be one of the most rewarding things in life … or for some, the worst. If all is not working out for you, and even if it is, I just bought ‘Relationship Rehab’ by Barry Watson. I thought this to be a fitting gift for my girls on Valentines Day. Don’t laugh because I take relationships seriously and I think this book would be excellent preparation before getting into a long-term relationship. The Ultimate Roadmap to Rescue and Revive Your Marriage or Dating Life in 90 Days! For the next two days get your FREE copy from Amazon here. Does your relationship seem miles away from where you idealistically imagined it would be? Have the pleasant discussions you once had together been replaced with silence or continual arguments? Do you feel as if you and your partner have slowly drifted away from the love and romance you once shared? If this is you, you aren’t alone! Many couples experience times in their relationship where they struggle to get along, and wonder whether the effort is worth the reward. The reality of life is that building a great relationship is a challenge! It takes a lot of skill and work to have a great relationship, and get it back on track when you have difficulties. Skills like this aren’t taught in school. Many times you are sadly left to find your own answers, or worse, learn from the pain of getting it wrong. In this book “Relationship Rehab,” Barry Watson outlines a very practical approach to rescue and revive your marriage or dating life. This book is filled with many easy to apply tips on how you can avoid many common mistakes, and how to build the type of relationship you want. If your relationship is important to you, then this book will give you the confidence and skills to make it great. This book is filled with wonderful advice for dating and married couples. There’s a free 90-day roadmap and coaching video and the book also includes a practical list of expectations couples can have of each other. I find this list of expectations super useful and will share this with my children because to be able to find common ground to agree on, we need to be aware of the expectations that happen on a moment to moment basis. What touched me most in this book is Barry’s eagerness and willingness to make his relationship work and make things happen. I was really moved by that. I highly recommend this book to anyone in any kind of relationship, pre-during-after marriage because there are so many insights and practical steps given that even the most reluctant spouse may be won over to give it a try. I was born and bred in New Zealand and are pleased to be an Amazon #1 Best Selling author. I am a fun loving ‘Kiwi’ who has a dry sense of humor and a contagious passion for life. My go-getter type attitude has helped many people realize their potential and achieve their personal goals. I am married to Nicola, my wife of 23 years, and together we have two children. It’s the no nonsense and practical skills I’ve learned, that I would now like to share with you, either through my books, social media or in person. Whether the relationship you’re in right now is rocking, or on the rocks, my hope is that we can help you to become stronger and more fulfilled as a person and as a couple. Barry’s book is available from Amazon for FREE on Valentines Day and the next two days! So get your copy now! NEW BOOKS RELEASES, INTERVIEWS AND REVIEWS – As a member of the Australian Christian Readers Blog Alliance and as a member of the Christian Indie Authors Reading Group and as the current Administrator of Christian Authors Worldwide, Omega Writers non-fiction and This is FUN! Launchparty, I share new book releases, interviews and reviews with my readers. Stay tuned! Categories: A BIT OF EVERYTHING, BOOK LAUNCH, NEW BOOKS REVIEWS INTERVIEWS, NEWS FLASH, WHAT IS LOVE? | Tags: Amazon #1 Bestselling author, Barry Watson, free 90-day roadmap, Genesis 2, Relationship rehab, rescue and revive your marriage, They shall be one flesh, what is love | Permalink. The Pope just called Christmas a charade because of all the atrocities in the world. Loving is loving, no matter what your religion is. If you don’t know how to, or have lost track of it because there is so much hatred … here are some guidelines, I don’t know of any better ones. I pray that you all may be kept safe! Categories: A BIT OF EVERYTHING, SONGS and VIDEOS, WHAT IS LOVE? | Tags: a message of love, all about love, love each other, share the laugh, what is love | Permalink. My last blogpost mentioned: God so loved the world, that he gave his only begotten Son, that whosoever believeth in him should not perish, but have everlasting life. This week we’ll see what Jesus has to say about everlasting life in the Gospels. This morning I listened to a podcast by Nehemia Gordon and Pastor A.J. Bernard. It was lovely to hear a Karaite Jew and Methodist Pastor in agreement about having the same Father walking along together in the journey of life and, for whatever reason, one has met the Son (been revealed to him) and the other one has not (yet?). No biggie. In the end we’re all children of the same Father and what matters is what’s in our heart and how that manifests in our life. As far as I’m concerned that’s the end of arguments and discussions about different belief systems and world view. There’s a whole bunch of Torah Pearls that Nehemia has created with Methodist Pastor Keith Johnson and they are well worth listening to. Yikes, I find that scary. Isn’t the common perception that once we are resurrected, we’ll go to heaven (enter into life) and, regardless of our previous sins, we’ll all look like gorgeous sixteen year olds (minus the acne) and never look back? Mmm, that is not what Jesus says here. Although some kind of transformation obviously takes place, having been resurrected. At that time, just days after His resurrection, Jesus’ wounds were clearly still showing. Mmm. My Bible teaching Pastor, whom I loved and adored, taught me that there is no everlasting fire. Jesus said there is; so I looked it up. There’s no getting away from it. Jesus really said and meant everlasting fire. How do I know that Jesus meant it? I know that for sure because in the Book of Matthew, Jesus did not refer to it just once, but he repeated his warning twice to make sure that we would really get it. rather than having two eyes to be cast into hell fire. What we’ve just established here is that according to Jesus there is hell fire, and that is where you’ll end up if you cause offence. And particularly if you cause offence to a little child or newcomer to the faith. What does it mean to cause offence? The warnings are very clear and specific. Don’t cause trouble with your hand, foot or eyes. With all your might, restrain yourself and do whatever is necessary to stop offending, even if this causes some kind of hurt or disability in your life. If you don’t restrain yourself and stop yourself from offending others or falling into sin, there’s a really hot place reserved especially for people just like you. Now what? If I make a blooper, and we all do, then what? Is that the end? No, that is not the end. Our Father is a forgiving Father. And there are many instances in the Jewish Bible as well as in the Gospels were we are told that, feeling sorry about having made stupid mistakes, accounts for much. In the Book of Luke we’re told that it is impossible to expect never to be offended. All I have to do is make sure that it is not me causing the offence! This seems like a very hard thing to do. Especially considering that many believers defend their belief with all their might, misguided as we all at times may be. I have, unfortunately, offended people by telling Christian jokes such as the one told by Emo Philips which has been voted the funniest religious joke of all times. If this joke was offensive to someone why would I give a link to it and refer to it and possibly cause offence again? Because the person who was offended by it, decided because of this joke, not to follow my blog any longer, and therefore won’t read about this again. And the joke simply points out the hypocrisy of certain believers. I posted the joke to say, ‘please don’t push me off the bridge just because I believe differently from how you may believe.’ And guess what? The first person who read the joke, pushed. Jesus told parables and therefore I believe that it is fine to talk in parables at times to get certain points across. After the warning, about not causing offence, Jesus gives guidelines on how to deal with people who trespass. What does trespass mean? It means doing the wrong thing by people. It means to sin. It means to break God’s law. and he cast into the sea, than that he should offend one of these little ones. If people genuinely feel sorry about doing wrong and genuinely ask for forgiveness, we are to forgive them. How many times? A lot of times. Why? In the end it always comes down to just plain old loving each other. What do you reckon? Here’s another reminder of what Love is all about. I have a huge soft spot for the Commandments because they spell it out so perfectly. Next week we’ll have a look at the second time that ‘everlasting life’ is mentioned by Jesus. Categories: A BIT OF EVERYTHING, LIVE FOREVER, PROMISES AND PROPHESIES, SONGS and VIDEOS | Tags: AJ Bernard, eternal life, everlasting fire, everlasting life, Keith Johnson, LIVE FOREVER, Nehemia Gordon, what is love | Permalink. Categories: A BIT OF EVERYTHING, SONGS and VIDEOS, WHAT IS LOVE? | Tags: apostle John, courtesy Art of Noise, Jesus, Love according to the prophets, Moments in love, Moses, this is love, what is love | Permalink. God spake to us from heaven. wow! As in really, we have all these witnesses. That is an incredible story and wonderful witness account. The Creator of the universe spake to us from heaven. What did He say? I looked it up. It’s powerful stuff. He gave his kids some rules to abide by. Really simple. Just ten of them. That’s all. According to scripture these rules link in with living forever. Check it out. See what you think. 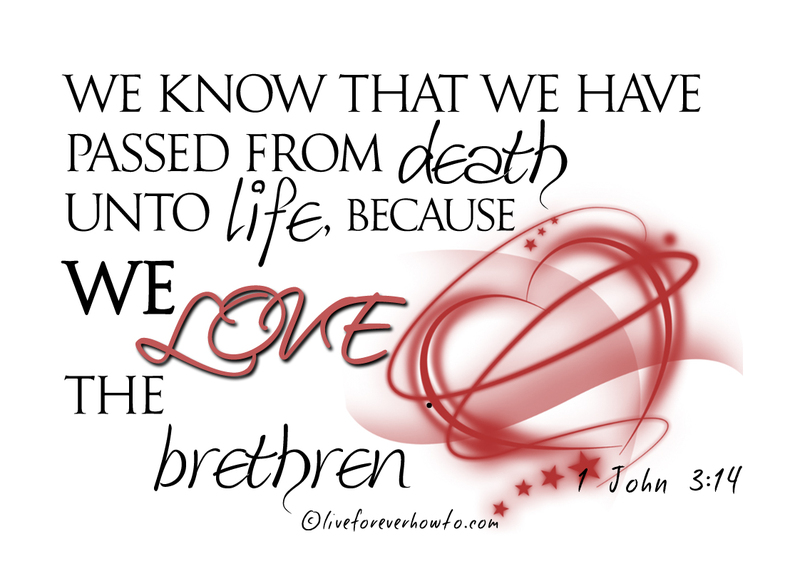 With Valentines day coming up I like to share with you what some of our prophets and apostles have to say about love. And this is a mere snippet of what has been said about love in the bible. From the prophet Moses and other wise men. What did the prophet Moses have to say about love? Moses said to love Go(o)d with all our heart and all our soul, to walk in all his ways and to keep his commandments, so that we may live. Moses also said to love the stranger as ourselves. All these wise men agreed with Moses that it shall be well with us when we love God, which is akin to being obedient and following his directions. Jesus reiterated what Moses said about loving God, each other and how this ties in to eternal life. and with all thy mind; and thy neighbour as thyself. But I say unto you, Love your enemies, bless them that curse you, do good to them that hate you, and pray for them which despitefully use you, and persecute you; That ye may be the children of your Father which is in heaven: for he maketh his sun to rise on the evil and on the good … Be ye therefore perfect, even as your Father which is in heaven is perfect. Has anything changed with regards to love and obedience? Around three and a half thousand years ago Moses told us that God said that He will be, shewing mercy unto thousands of them that love me, and keep my commandments. Jesus reiterated this message when he said, if ye love me, keep my commandments. And he added, He that hath my commandments, and keepeth them, he it is that loveth me: and he that loveth me shall be loved of my Father, and I will love him, and will manifest myself to him. So what did God say when he spoke to us from heaven? He send us a message of love. He told us how to love each other. I like the commandments because it sets an easy moral standard to live by that we can all adhere to. The commandments are a message of love. It is a standard which was set in heaven for human beings to stick to. Living by this standard guarantees a loving spirit. I know that there are churches nowadays that teach their followers that they have been made holy simply by believing and having faith. What message does apostle John have for these churches? … whoso kept his word, in him verily is the love of God perfected: hereby know we that we are in him. 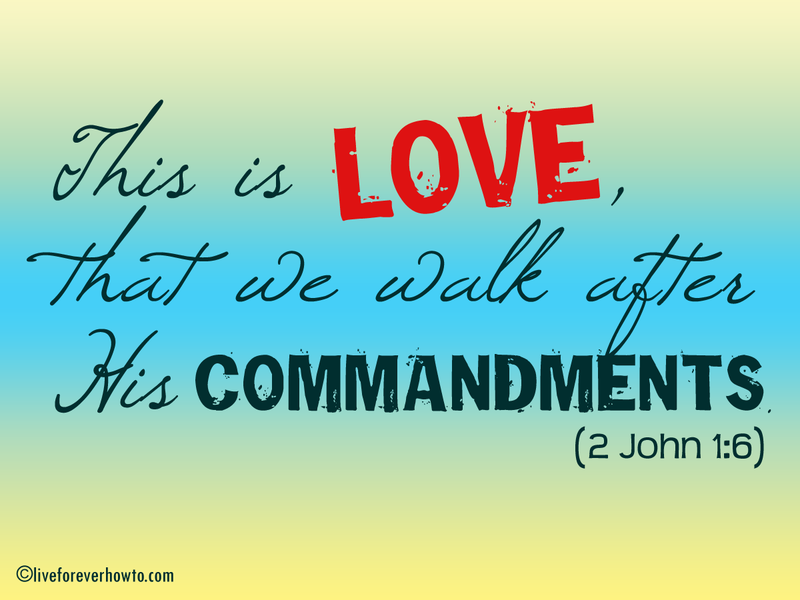 And this is love, that we walk after his commandments. Let me know what you think. Share with me in the comments below. Categories: A BIT OF EVERYTHING, LIVE FOREVER, PROMISES AND PROPHESIES, SONGS and VIDEOS, WHAT IS LOVE? | Tags: a message of love, commandments, Love according to Jesus, Love according to Moses, love according to the disciples, Love according to the prophets, love your enemies, The Ten Commandments, this is love from 1John 5:3 and 2 John 1:6, what is love | Permalink.